The reign of the nebula continues in September, but the bright objects of Sagittarius give way to the fainter and subtler clouds of Cygnus. First on our list is the extended object known as the Veil Nebula. Six or seven thousand years ago an ancient star exploded and scattered its remains across the sky. Today those remains form a complex of nebulae known as the Cygnus Loop, and its two brightest parts form the two halves of the Veil Nebula. Both halves are large—more than twice the diameter of the full moon—and require a short focal length and a large-field camera. Try using a Hα and/or OIII filter to increase the contrast. Nearby is another vast nebula: NGC 7000, also known as the North America Nebula. If you find it difficult to capture the entire object (which does resemble the North American continent) you can try focusing on interesting portions. This nebula also benefits from narrowband filters such as Hα and OIII. For those of you with smaller fields of view, September also has its share of medium-sized nebulae. 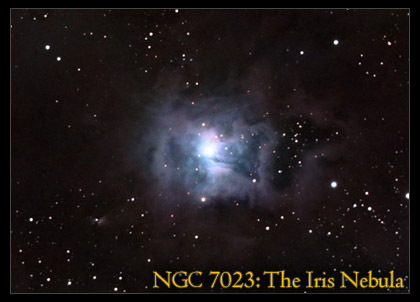 My favorite this month is probably NGC 7023, known as the Iris Nebula. To me it looks like an alien moon shining through a hole in the clouds. It is easy to capture the bright center of the Iris Nebula, but its faint and dusty envelope require much longer exposures. The Cocoon Nebula (IC 5146) and the Crescent Nebula (NGC 6888) are also excellent targets. The Cocoon Nebula looks like a miniature Trifid Nebula and reveals soft and dusty features. In contrast, the Crescent Nebula looks like a brain in space with thin, branching features. Both will benefit from long exposures and high resolution. 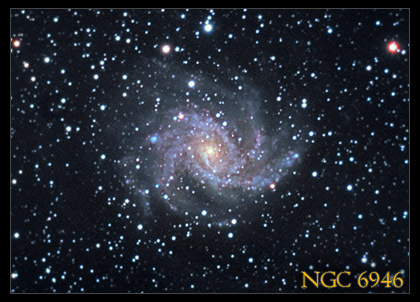 Our last object his month heralds the coming autumn galaxies: NGC 6946 is a bright and large spiral galaxy in Cepheus and well worth spending time on. Though sitting in a field crowded with Milky Way stars, NGC 6946 reveals intricate details and reminds us that galaxies will soon fill our skies again.